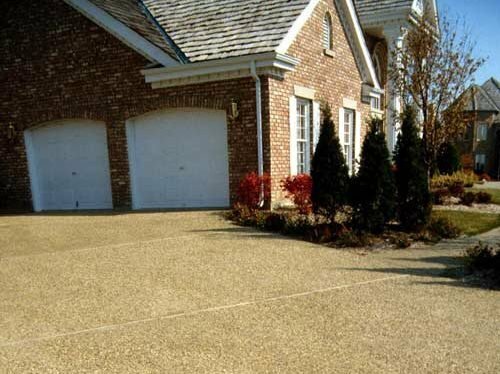 Applying a transparent concrete sealer to an exposed aggregate surface can improve both its performance and appearance. These sealers-typically film-forming acrylic resins-can help protect against spalling, dusting, efflorescence, freeze-thaw damage, stains, deicing salts, and abrasion. A sealer will also enhance the color of the aggregate, accentuating its depth and richness. When applying the sealer to fresh concrete, make sure all cement paste residue from the exposure process has been thoroughly removed to avoid sealing the milky-looking white paste on the surface. On existing exposed-aggregate concrete, thoroughly clean the surface from oil, grease, dirt, and stains before applying a sealer. (See Cleaning Concrete.) Use a short-nap roller for the best application results. Expo-Gloss from W.R. Meadows and Wet Look Lacquer from Glaze N' Seal are examples of sealers formulated specifically for use on exposed aggregate concrete. These products should be applied to clean surfaces that are free of contaminants. A brush, short-nap roller, or airless sprayer can be used. Whichever brand of concrete sealer you use, be sure to follow the specific instructions for the product, both for surface preparation and application, and make sure the sealer is recommended for use on exposed-aggregate concrete. This link provides a list of concrete sealer manufacturers. An exposed aggregate surface is rugged, nonskid and resistant to heavy traffic and weather extremes. Little maintenance is required, other than occasional cleaning (see procedures for plain concrete) and resealing. Applying a transparent concrete sealer to an exposed aggregate surface can improve both its performance and appearance by helping to protect against spalling, dusting, efflorescence, freeze-thaw damage, stains, deicing salts and abrasion. A sealer will also enhance the color of the aggregate, accentuating its depth and richness. Apply sealer to a clean surface free of dirt and contaminants using a brush, short-nap roller or airless sprayer.